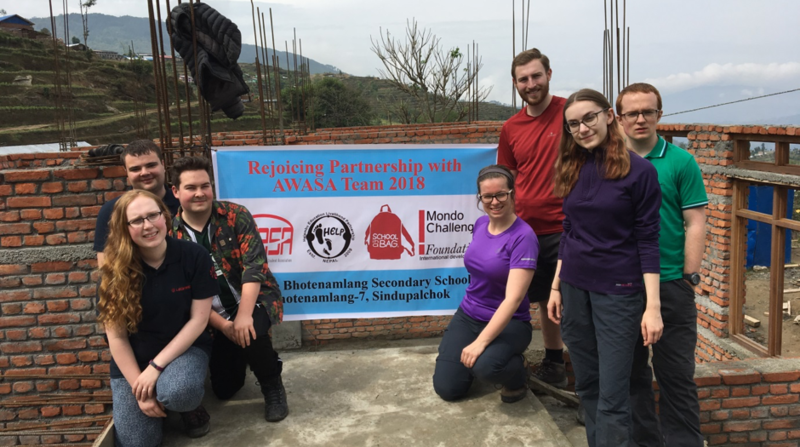 The AWASA (AgustaWestland’s Apprentice and Student Association) visit to Nepal saw a group of 7 trainees head to Nepal to visit the community of Bhotenamlang where two years of fundraising efforts are to culminate in the construction of a school for the local students in collaboration with School in a Bag, Mondo Foundation and HELP. 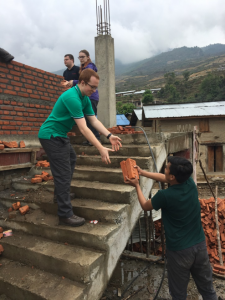 Whilst visiting the village, the group from Somerset were tasked with assisting with a number of tasks which simply wouldn’t happen on a contruction site in the UK. For instance, the team were tasked with sifting mounds of sand to separate the large stones from the finer sand. This sand would then be mixed with cement to form the mortar required to lay the bricks of the structure of the school. Considering that in the UK, we could easily as popping to get a pint of milk, could pick up a bag of pre-sieved sand ready to use! 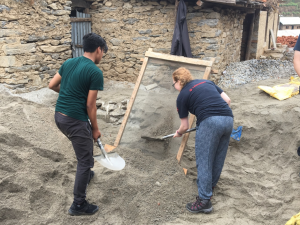 As well as sifting the sand, we assisted in carrying bricks to where they were needed, helping to mix the mortar, and some of the group even got to lay some of the bricks themselves. Being able to contribute to help the local builders was a very proud moment for the group and made the two years of hard work of fundraising worth the effort. The community was obviously very proud of the school and it was humbling to see members from all parts of the community chipping in to get the school completed efficiently. Whilst in the village, one of the highlights was being invited to the school’s celebrations for Buddha’s birthday. We were treated to dancing by school children and were made to feel welcome by the whole community. We also had an opportunity to teach the children for a period which gave us an opportunity to see what a big difference the new school building will have on the classroom experience of the students. 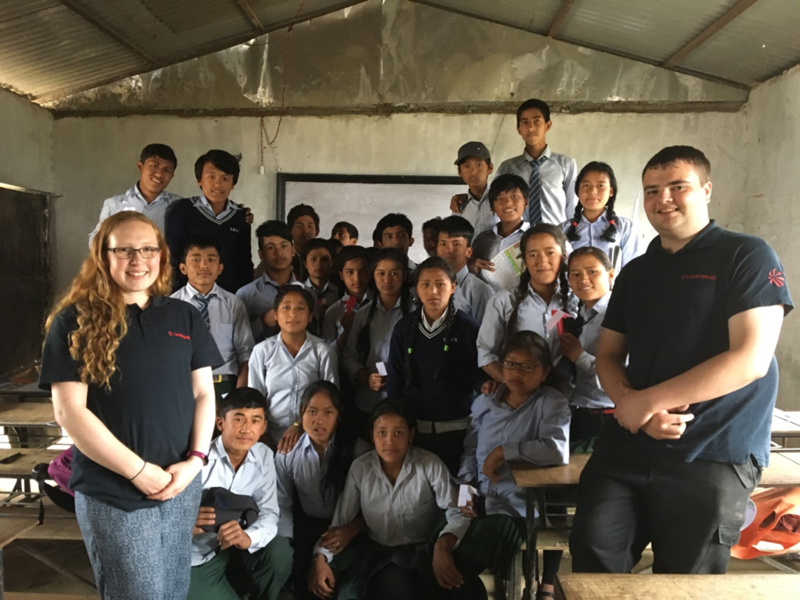 In addition to spending time in the village of Bhotenamlang, the group visited Shree Chandika Secondary School to distribute 200 bags which they had packed a few days earlier at the HELP offices in Kathmandu. This was a great experience as the children were very excited to receive their new school bags and it was great to be made to feel so welcome again. The remainder of the time in Nepal allowed the group to do some sightseeing and visit the Chitwan National Park for some white water rafting, a jeep safari, canoeing trip and even got to bathe elephants. 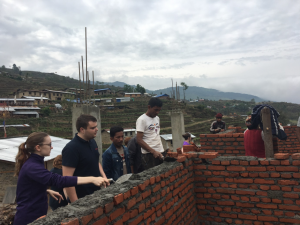 In all, the trip was a ‘once in a lifetime’ experience and the group have come away feeling great pride in the fundraising efforts they have achieved and are excited to see the final outcome of the school on completion, having seen first-hand the impact the school will have on the community in Bhotenamlang.